The Tiny Salamander Stove has been designed to fit the amazing ‘small’ spaces that people are now designing and building all over the world. It is also scaled to fit into most ornate cast iron surrounds so that these lovely period features can be preserved. The inefficiency of an open fire can be replaced with an efficient stove whilst retaining the original fireplace. get these great additions FREE! Start your fire with this limited edition ZIPPO lighter. Armour cased, these lighters are a design classic and are cool little woodstove accessory. We have had 50 made especially for us by ZIPPO in the USA. 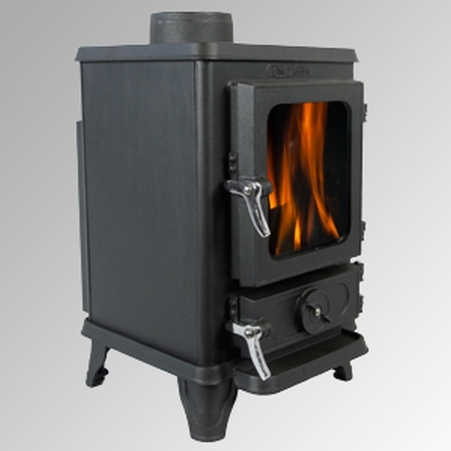 A full colour image of our tiny wood stove has been embossed onto the side of this reliable lighter. We chose a heavy weight case in polished chrome for that real touch of class. Simply fill with water and place on your woodburning or camping stove and you soon start to produce your own electricity. Included in this special introductory off is a handy USB cable desk/camping/off grid lamp. Charge your phone and see the light with the new MiniO power generator.